Tomoko DeLaTorre excels at spatial analysis, map production, and 3D graphic design to improve people’s mobility. Tomoko specializes in GIS analysis and cartography. She focuses on creating, analyzing, and displaying spatial and statistical data for a wide range of planning projects as well as public information materials. Her experience includes analyzing demographic changes, bike demands, ridership patterns, transit service performance, and parking demands. 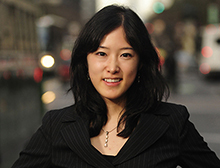 Tomoko has worked on numerous projects as a lead GIS analyst, including the Portland Long Range High Capacity Transit Plan and the Seattle Transit Master Plan. Tomoko also has conducted bike demand analysis for Honolulu, New Orleans, and Rochester, Minnesota. Share the post "Tomoko DeLaTorre excels at spatial analysis, map production, and 3D graphic design to improve people’s mobility."